A stealth game that turns you into a predator rather than prey. Mark of the Ninja is an engaging sandbox of stealth. There's a guard in my way. I need to get to the air vent he's stoically defending, and there's about ten yards of well-lit room between him and the shadow-shrouded gantry I'm hiding in. This is a serious problem. Not because I can't figure out a way to stalk past the dunce and continue on my journey through to the top of this mercenary-infested skyscraper, you understand. Quite the opposite, in fact. There are just so many options at my disposal that I'm struggling to choose one. I could use my grappling hook to zip between the light fittings overhead, drop down behind him and plunge a sword in his back. Quick, clean, and efficient. But a bit dull. A more creative approach involves a spike mine – a wicked, bear-trap kind of snare that instantly kills anyone who walks across it. If I threw one of those on the ground, then threw a dart to smash the lightbulb above it, the guard would come to over to investigate, trigger the mine, and find himself a pair of legs short of a fully-functioning bipedal frame. Of course, if I was feeling merciful I'd just chuck a smoke bomb at his feet and use the visibility-limiting fumes to sneak by unseen. 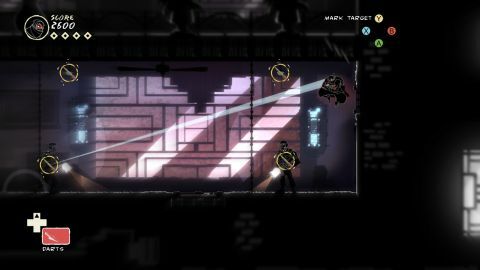 Mark of the Ninja is an intelligent, unpatronising game, built on exploitable systems and consistent rules. Its linear but multi-route levels are really just collections of puzzles – here's the room with two guards standing above the vent you enter from, here's the room full of dogs who sniff you out of your hiding spot. You solve them through creative employment of your ninja's bursting utility belt and selection of moves. It's a game unafraid to be empowering: hold Ctrl (or the right trigger if you're using a gamepad), and time will stop indefinitely: giving you as much peace and quiet as you need to aim that noisemaking firecracker or plan your next move. Even more useful, however, is the game's visual design. There's a cartoon crispness to the graphics (which Klei have shown off before in Shank), but Mark of the Ninja's real triumph is the way it conveys information through its art. A neat line-of-sight effect shrouds areas beyond view in murky uncertainty, while the colour vanishes from your ninja's garb to show when he's hidden in the dark. The handling of sound is inspired. You can see sound waves emanating from their source, like ripples in a pond, and even view them in advance when aiming tools – enabling you to meticulously place your distractions or set traps unheard. To preserve challenge, Mark of the Ninja consistently introduces fresh enemy types with skills that counter yours across the course of the five hour campaign. Even without this, it is an aggressive, emboldening take on stealth. Mark of the Ninja gives power and information to the player, and trusts that you know what to do with them.